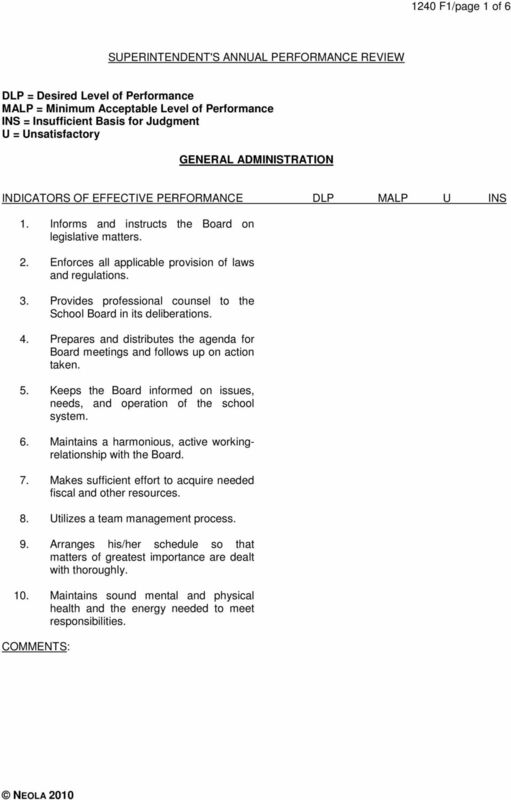 Download "SUPERINTENDENT'S ANNUAL PERFORMANCE REVIEW GENERAL ADMINISTRATION INDICATORS OF EFFECTIVE PERFORMANCE DLP MALP U INS"
2 1240 F1/page 2 of 6 PLANNING AND EVALUATION 1. Provides a process which produces clear, complete statements of goals and objectives. 2. Develops and implements long/short range plans for achieving Corporation goals and objectives and recommends such plans to the Board. 3. Recommends specific procedures and programs for attaining current operational objectives. 4. 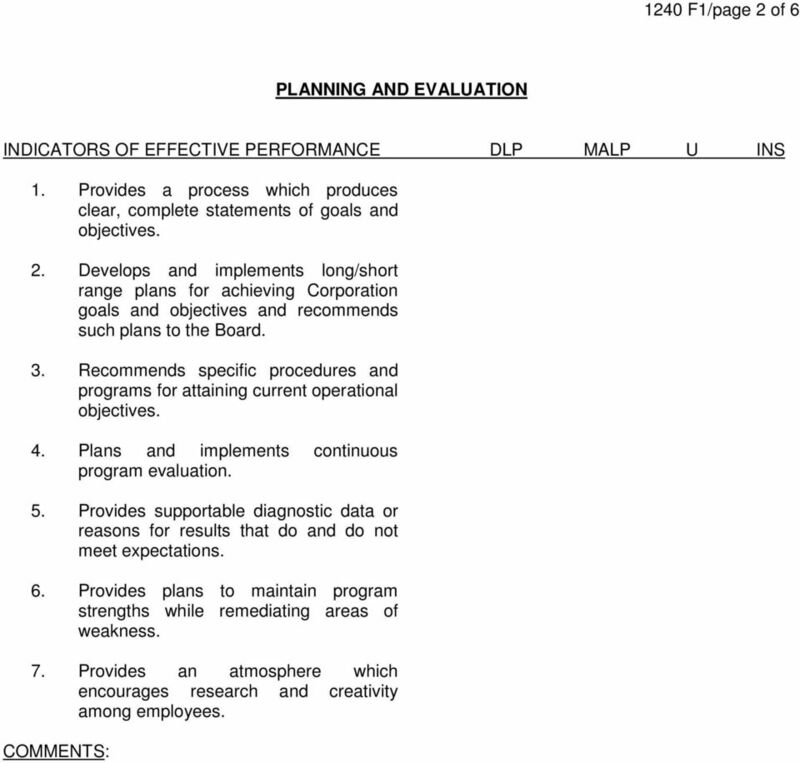 Plans and implements continuous program evaluation. 5. Provides supportable diagnostic data or reasons for results that do and do not meet expectations. 6. Provides plans to maintain program strengths while remediating areas of weakness. 7. Provides an atmosphere which encourages research and creativity among employees. 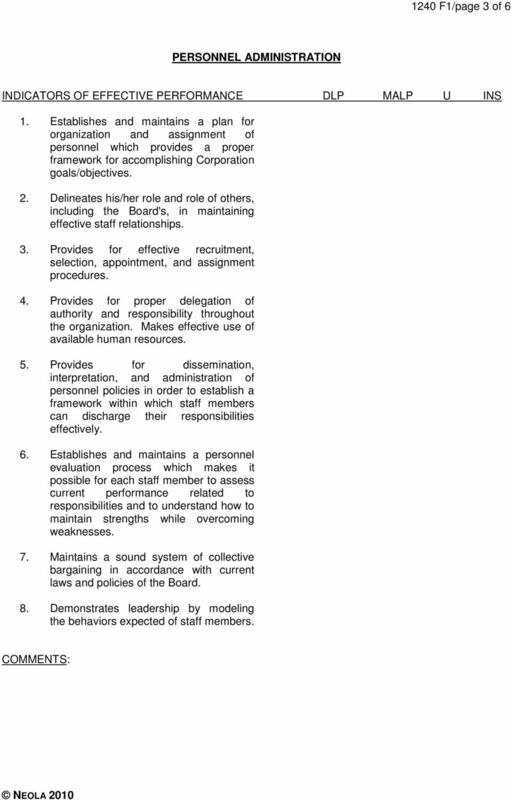 4 1240 F1/page 4 of 6 STAFF DEVELOPMENT 1. Determines staff needs in relationship to accomplishing Corporation goals. 2. Develops and implements programs for staff growth and development which make it possible for participants to accomplish Corporation goals more effectively. 3. Provides for the development of leadership necessary to guide present and future staff actions toward achievement of Corporation goals. 4. Plans for and participates in a program of personal and professional growth. BUSINESS MANAGEMENT 1. Directs preparation of the annual Corporation budget and recommends its approval by the Board. 2. Manages the School Corporation within approved budget limits. 3. Supervises business operations to ensure efficient, productive business transactions. 4. Makes certain that funds are invested with maximum return relative to safety of principal and that adequate control and accounting measures are utilized. 5. Provides for comprehensive financial planning for the Corporation. 6. Ensures that purchased services, equipment, and other resources meet quality standards for performance, reliability, and durability. Vice President of Public Relations Job Description Vice President of Marketing: 2. Be responsible for all SGA publications and publicity for all events, while creating posters and flyers for events. 3.